This tempestuous religious drama from the creator of Borgen is a thundering, tense exploration of family and faith. “God moves in a mysterious way, His wonders to perform, He plants His footsteps in the sea, And rides upon the storm.” Those are the words of William Cowper’s 1774 poem that give Walter Presents’ new TV show its title, and they set the tone for this tempestuous Danish drama, a thundering tale of storms brewing in a devout family – and the people trying to ride them out. We meet the Krogh family as they prepare for a higher calling: the election of priest Johannes (Lars Mikkelsen) to Bishopdom. But becoming the head of the Copenhagen diocese is no simple matter, and the politics involved are a complex blend of ambition, showmanship, strategy and humility. 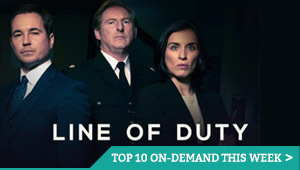 No wonder, then, that the writer behind this exploration of duty and devotion is Adam Price, the creator of the hugely successful Danish drama Borgen. With equally complex issues and dynamics at play behind Denmark’s altars, it’s safe to say Price has another hit on his hands. Johannes’ main rival comes in the form of Monica (Laura Bro), who represents everything he isn’t: she’s young, female, progressive and open to dialogue between faiths. Johannes, on the other hand, is the face of tradition – and you can see the weight of it etched in every line and wrinkle. He’s weathered a life of tumultuous fidelity, and it shows. That tension between new and old, between the present and the past, is right at the heart of Price’s drama, and it plays out with a profound mix of the personal and the professional: at home, Johannes’ sons are expected to follow in his footsteps, but find themselves clashing, as they make their own path through his corridors of rites and passages of heritage. His eldest, Christian (Simon Sears), still has some sense of spirituality, but dropped out of the church and has instead ventured into business – a far cry from the life of piety his father would have him lead. Perhaps even worse, though, is the earnest August (Morten Hee Andersen), whose passionate commitment to his calling has turned him into the toast of Copenhagen’s clergy, a rising star with a crowded congregation and charismatic preaching style. That success leads to August being deployed as a military chaplain in the Middle East, taking him away from home, even as he stays close to his father. That dual relationship underpins the tension running through the drama, as Johannes consciously positions himself as both a son of God and the father of a family, a dynasty that is powered by the pressure of filial obedience, even as Johannes moves in his own mysterious ways – not only because of Johannes’ dominant personality, but because that conviction is, in itself, fuelled by the Biblical stories of fathers and sons passed down through generations of a patriarchal establishment. Price builds these layers up with a frank, nuanced understanding of family disputes, and it’s this carefully assembled construct of male identity that makes the role of women so interesting and incendiary, from the family matriarch Elisabeth (played Ann Eleonora Jørgensen with strained resilience and strength) to Laura Bro’s provocative, confident Monica. The result is a superbly acted ensemble drama, a chamber piece of cloistered, claustrophobic pressure – and under that pressure, we witness Johannes starting to crack. Tortured and increasingly unbalanced, the only constant in his life is his faith, even as he strays into affairs, drink and other vices. And so he processes everything through that lens, seeing Monica, a threat to his plans, as a figure of evil. Are they genuine visions or hallucinations borne out of a family with a history of mental health issues? Ride Upon the Storm’s brilliance is that it could be either, while also being entirely irrelevant; regardless of the answer, the one thing that’s unwavering in Johannes’ life is his fanatical dedication to something that’s tearing him (and those around him) apart. As Price deftly deconstructs that poisonous masculinity, the visuals follow suit, descending from the clean, white compositions you expect from crisply composed Scandi noir into dark, visceral flashes of something less wholesome. 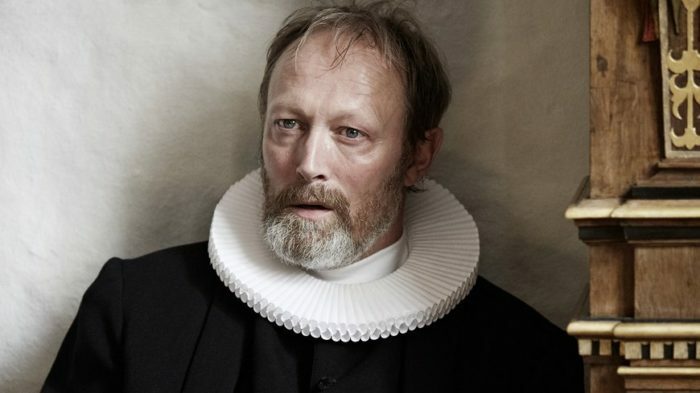 The drama is driven by the thundering presence of Lars Mikkelsen, who delivers a career-best performance as the bearded Johannes – he’s at once imposing and heartbreakingly vulnerable, as he stands in the face of the winds of change. One sequence where Johannes rages at the dying sky, howling the Lord’s Prayer, is jaw-dropping in its raw, emotional power – as riveting as the suspenseful war sequences that shoot through the second episode. Inner and external conflict, local and international politics, forgiveness and rebellion; all of them are at play in this majestic, turbulent sea of shifting values, where good and bad are in constant flux. “Jesus loves a happy ending, but I prefer… consequences,” says our troubled priest at one point. 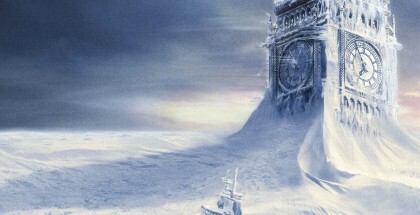 Ride Upon the Storm braces itself for those to come, drawing a line between hope and faith – and forsaking the former. Ride Upon the Storm premieres at 11pm on Channel 4 on Sunday 27th January 2019, with the whole box set then available in full on Walter Presents.